“[t]hese mysteries …are past in certain circumstances, and they are lasting and are present and perpetual in a certain other way. They are past as regards their execution, but they are present as regards their virtue, and their virtue never passes away. So…the spirit, the state, the virtue, the merit of the mystery is always present….That obliges us to treat the things and mysteries pertaining to Jesus not as things which are past and dead, but as things living and present, from which we too have to harvest fruits which are present and eternal.” (59-60). “In order to supply a Biblical foundation and greater depth to our meditation, it is helpful to follow the announcement of the mystery with the proclamation of a related Biblical passage, long or short, depending on the circumstances. No other words can ever match the efficacy of the inspired word. As we listen, we are certain that this is the word of God, spoken for today and spoken ‘for me’. In addition to the two suggestions of the Pope, I am going to suggest another way to use the Rosary to deepen meditation, a method that may be more advisable when you are praying the Rosary alone and have ample time. It is permissible and even encouraged in meditation to use our imagination to enter a Bible scene one may be mediating on to adore the Lord (as in His Nativity), or to console the Lord (as during His Agony in the Garden), and ultimately to converse with the Lord in an intimate manner. Saint Teresa of Avila is adamant that meditation should lead to conversation (see, for example, Peter Thomas Rohrbach’s book, Conversation With Christ)! Thus, in the period of silence proposed by the Pope one could use his or her imagination to “enter into” the Rosary mystery in order to praise, adore or console the Lord, and then to talk to the Lord. As previously mentioned, these mysteries are “living and present” and contain particular fruit for each of us. Jesus came for each one of us: therefore, enter into the mystery, talk to Jesus, stay with Him for a while, share with Him His joys and sorrows, console Him, and let Him console you, and tell the Lord your problems and needs. Allow yourself to be present to the Lord in the mystery you are praying. You can then linger with the Lord in the mystery as you pray the Our Father and the ten Hail Marys. With practice, this method of praying the Rosary could deepen your level of intimacy with the Lord. EXAMPLE: You come to the First Sorrowful Mystery, The Agony in the Garden. Per the recommendation of Saint Pope John Paul II, you read and listen to a Gospel account of our Lord’s Agony in the Garden, and then observe a period of silence to focus on the mystery. I am then recommending that you use your imagination to walk into the garden of Gethsemane to kneel next to Jesus, to look at Him, to console Him, and then to converse with Him. You might even put your arm around Him and tell Him of your own sorrow for the sins you have committed. Become a very dear friend of Jesus. Then pray the prayers for that decade with the mystery and your encounter with Jesus lingering in the background. You need not do this for every mystery, but it should prove fruitful if you can do it for one or two of the mysteries, depending upon how much time you have. 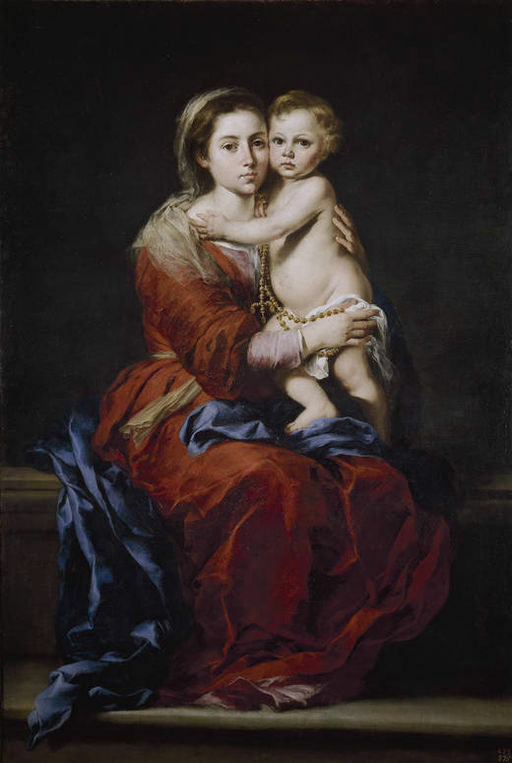 Image: The Virgin of the Rosary by Bartolome Esteban Murillo, around 1650-55, Public Domain, U.S.A.
← YOU ARE SURROUNDED BY A GREAT CLOUD OF WITNESSES: THE SAINTS!